Germanic tribes, and were eventually driven underground. though immaculately gorgeous, was not generally looked upon too fondly at the time. 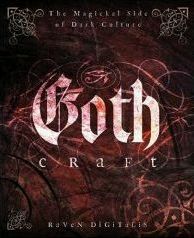 the focus of my book Goth Craft. philosophy. What influence has Buddhist philosophy had on your spiritual and magical practices? none other. Buddhist thought has many psychological levels that are applicable to anyone in any moment. 3. Um, now I have to ask, what is Georgian Wicca, and how is it different from other traditions? herself, here in my hometown of Missoula, Montana. 4. Joy Division or New Order? 5. What do you feel is one of the biggest misconceptions about the Goth culture? different viewpoints from most people and tend to express the darkness of our minds and society through dark art. 6. Who are some of the people that have inspired you spiritually and magically? Corgan of The Smashing Pumpkins and Anna-Varney Cantodea of Sopor Aeternus and the Ensemble of Shadows. hoot-and-a-half. We are all soul-connected so it made for a magickal, bonding time. 8. Liquid or pencil eyeliner? Any brand you’d like to endorse? Stargazer, Urban Decay, and GoodGoth. I’m gonna get a cup of tea and write some more of this short story I’m working on. Okay… What are your thoughts on genetically modified food? science we may not have achieved the fabled all breast meat Kentucky Fried Chicken ( http://www.snopes. mind that those advances aren't helping the people they should. 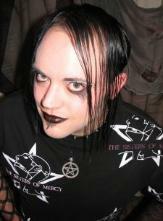 Opus Aima Obscuræ, and is a radio and club DJ of Gothic, EBM, and industrial music. convergence of two vital subcultures."